The forecast for today was in the 60s and overcast with scattered rain. It rained off and on all day. Not a day for the pool. I had to come up with something to do with the kids so we'd all be happy. I decided to take them to a movie. We went to the Wonderland theatre in Niles. We saw "Judy Moody and the Not Bummer Summer". I was worried it'd be dumb but it was alright. I would put it in the same category as "Ramona and Beezes" (I liked this better than Judy Moody). After the movie we stopped at McDonald's for 59 cent ice cream cones. I thought that was enough fun for one day but Mickey thought otherwise. 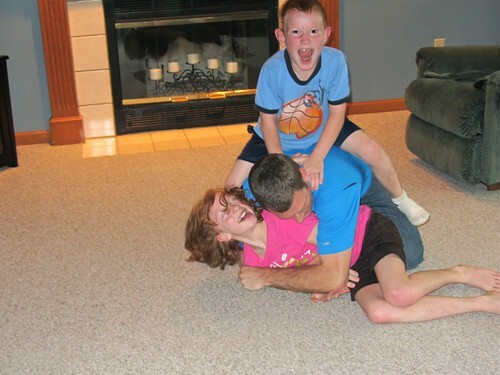 A wrestling match was needed to complete the day. Kade has the upper hand for a moment but he was on the bottom within a few minutes of the photo being taken. Meg was on the couch getting video footage with her iPod. Poor little 60 pound Mattey.